Foliage of the black tupelo tree, Nyssa sylvatica. We live in the northernmost part of native range of this beautiful and stately tree. The underlying color of foliage is yellow–leaves begin yellow and turn green when they begin to produce chlorophyll. So why do some trees go to the trouble of turning fiery red in fall? There are several theories. Some woody plants, vines in particular, turn red to signal to birds that their berries are ripe (birds have excellent color vision). Virginia creeper and poison ivy, two native vines that are particularly beneficial to wildlife, turn fiery red in fall, usually while the trees around them are still green. Ecologists call this a foliar flag. 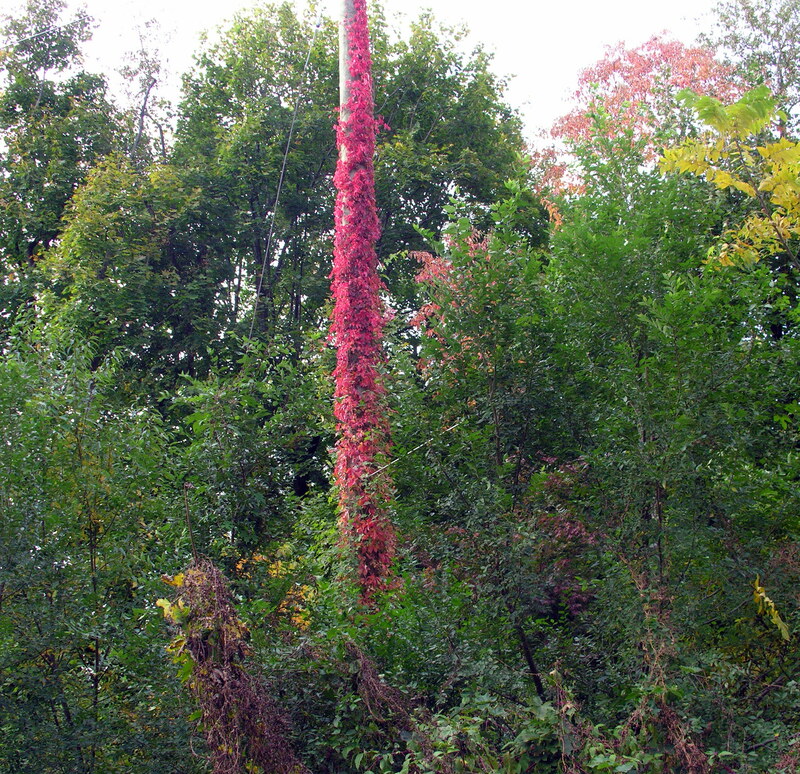 A foliar flag: poison ivy growing up a tree trunk turns red in early fall, while the tree that supports it is still green, to signal to birds that its berries are ripe. But maples and tupelos both flaunt bright red foliage in fall, although their fruits ripen much earlier in the season. Why do the trees waste all the energy it takes to produce red pigment? There are many theories: to protect against insect damage or sunburn at the crucial time of leaf abscission, or to fool insects into thinking the tree is dying; they’re neatly summarized in today’s NY Times. Read about it there, and be sure to get outside and enjoy the short-lived show. 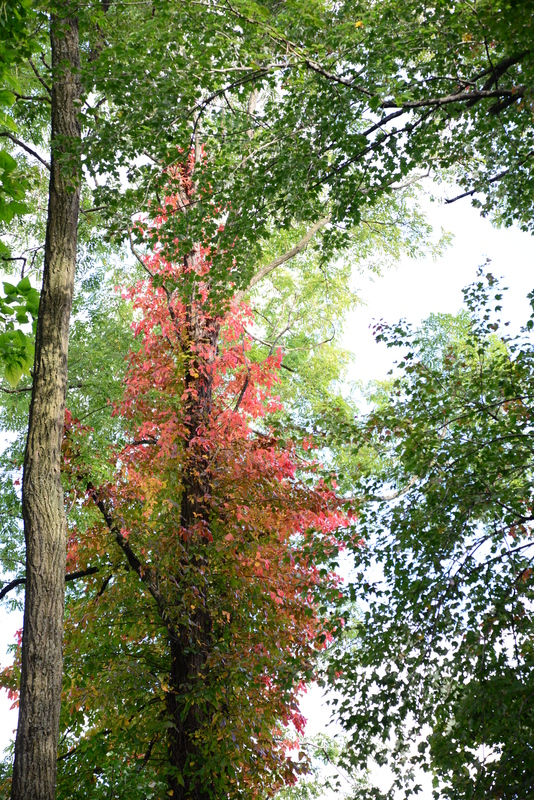 There are lots of lovely red and sugar maples around our area, and even a few tupelos. 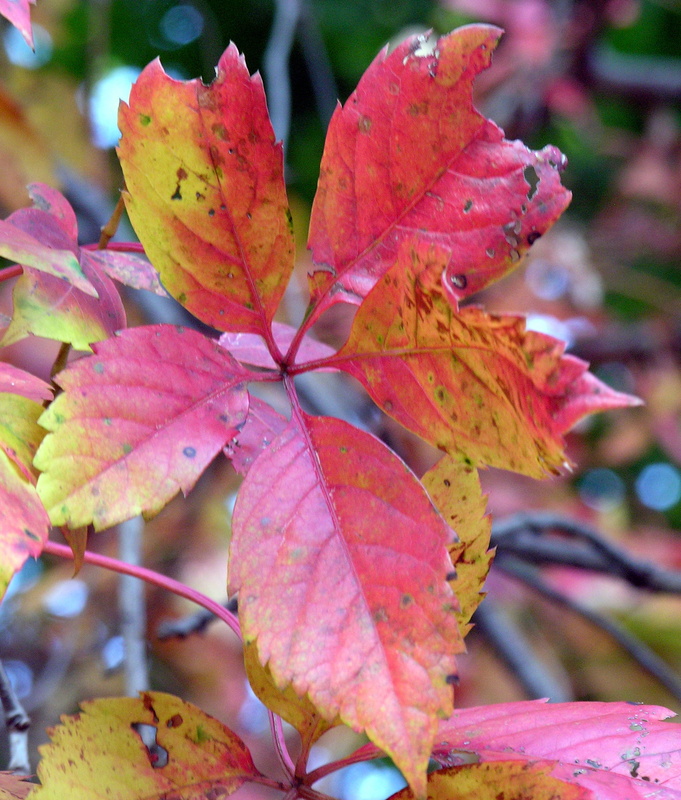 I’ll leave you with a brain teaser: the foliage of which native shrub turns a deep purple/pink color in fall? Native sugar maples are plentiful in our area; they turn beautiful shades or red and orange. Many dogwoods and viburnums turn dark red. For once, the picture really doesn’t capture it. I wish I could convey the exact shade of pink/orange/red/scarlet of the leaves of Virginia creeper (Parthenocissus quinquefolia). I guess you’ll just have to grow it for yourself. It’s spectacular. The only vine that rivals it as a foliar flag is our old friend poison ivy. To find out why vines, in particular, turn such brilliant colors, look at this post. We tend to think of autumn as a time of dormancy, but plants are extremely busy with winter preparation. Some things they do are obvious, such as when the huge acorns of northern red oaks or swamp white oaks hit the roof (some parts of Bergen County are having a mast year now; we had one around here last year). 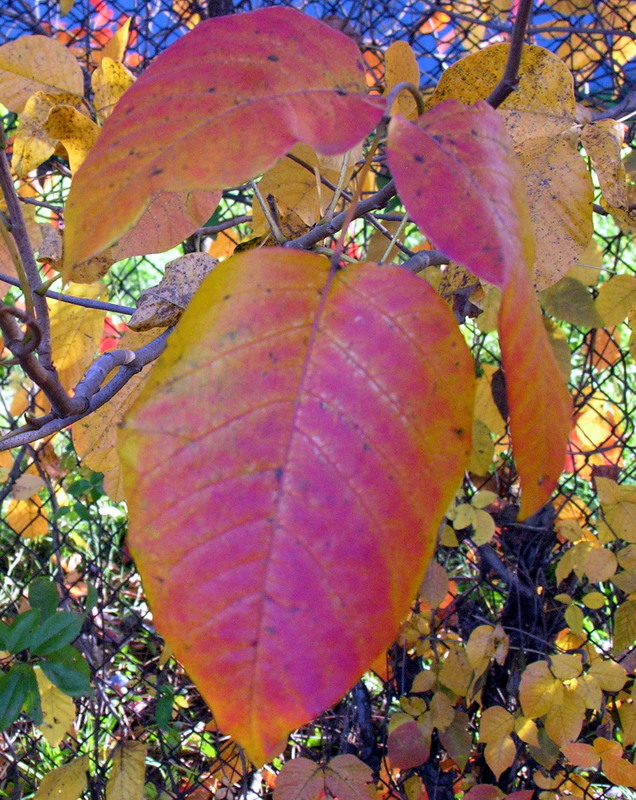 Autumn colors mean that plants are stopping photosynthesis, withdrawing green pigments and revealing other underlying colors. Next year’s buds have formed, and many perennials are putting out rosettes of new foliage. Some fruits are very prominent, some are already gone, snatched up eagerly by migrating birds. The plants are working hard to prepare for winter, taking advantage of the autumn sunshine. – water newly installed perennials and woody plants and vegetables as needed. The recommended amount is 1 inch per week during dry spells, but we received a good soaking this week (3 inches of rain according to my yogurt-container rain gauge), so hold off for now. – do not prune woody plants. Trees and shrubs are carrying out leaf abscission, the complicated process of shutting down for winter. (That’s what makes those lovely colors.) This process takes a lot of energy, so plants don’t have energy to spare for making scar tissue. The next pruning window will come when plants reach dormancy in late fall. – harvest fall crops such as lettuce, spinach, and other salad greens. Harvest winter squashes. Remove spent plants. Do a thorough clean-up of the vegetable garden. Do not compost diseased or pest-infested plants. Spread a layer of compost over the vegetable garden to prepare the soil for next year. – established perennials should need no care. Leave seedheads in place–birds will eat the seeds you don’t collect. – save your autumn leaves for compost. Decide where you will keep them. Consider mulching them into your lawn as fertilizer; this is easy to do with a mulching mower. – consider fall planting. It’s getting to be a bit late to plant perennials, but many woody plants can be planted until the ground freezes. Relax and enjoy the beautiful autumn colors! This is a beautiful native vine whose berries are highly attractive to wildlife. It’s lovely throughout the growing season; in autumn, it displays a foliar flag to let the birds know that its berries are ripe. More birds eat its berries than those of almost any other plant. You know that I’m describing poison ivy (Toxicodendron radicans), right? Check out this post on the Beautiful Wildlife Garden website for more information about this very important native plant. For one thing, only humans are allergic to it. And among humans, by no means all are allergic. I have seem estimates ranging from 30 to 50 percent of people are quite immune. So, if you have a large property, perhaps containing some land where people never go, you might consider not eradicating the poison ivy there. You’d be doing the wildlife a favor. This picture, taken last fall along the PSE&G right of way that cuts through Hamilton Avenue in Glen Rock, shows what ecologists call a foliar flag. This vine–you know that it’s poison ivy, right?–turns brilliant red in early fall just when its berries ripen. And it doesn’t do it for our aesthetic enjoyment. It does it to advertise to the birds that its berries are ripe–that’s the flag. When the vine’s leaves are green it’s hard to see the plant among the tree leaves, so the vine has to do something special so the birds will eat its berries and scatter its seeds. Here’s another picture of poison ivy doing its autumn thing taken a few days ago in the Thielke Arboretum. Poison ivy does not hurt the trees it climbs, and it has especially nutritious berries that are devoured by many, many species of birds. Also, despite its scary name, many people are not allergic to it. Of course we need to remove it from places where children play, but we also need to remember that it plays an important ecological role and leave it along in natural areas. It is native and does not become invasive. 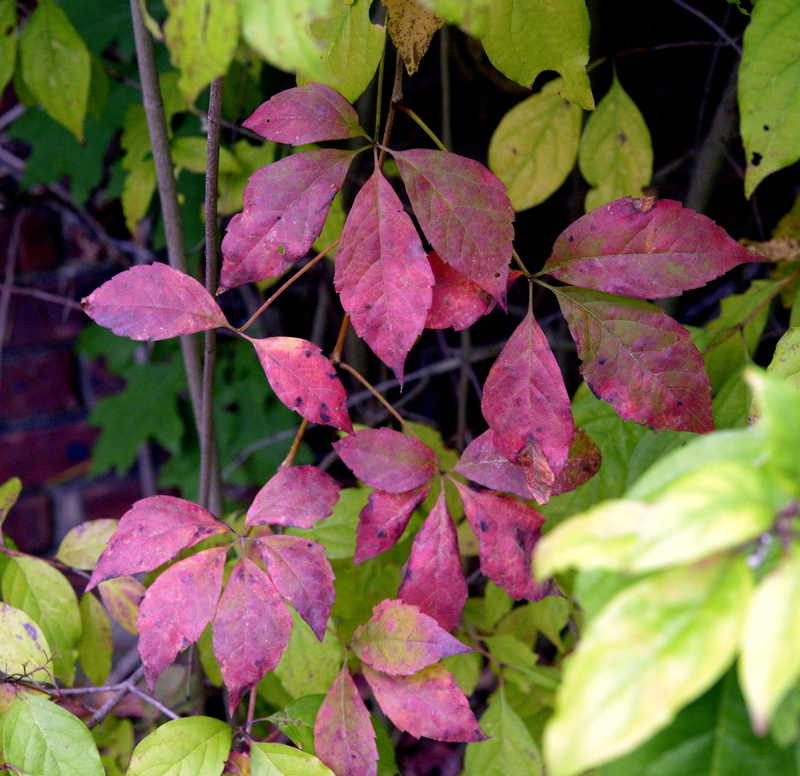 Another native vine that turns gorgeous fall colors is Virginia creeper (Pathenocissus quiniquefolia). Like poison ivy, it has nutritious berries that birds seek out and that ripen in early fall, so it too produces a foliar flag. also like poison ivy, it does not harm the trees or structures it climbs. If you have an ugly brick wall you would like to cover, consider this lovely plant. Both these vines are very common in our area. They’re easy to tell apart: Virginia creeper has leaves made up of 5 leaflets. Poison ivy has three shiny leaves that are reddish in early spring, bright green in summer, and orange or red in fall.